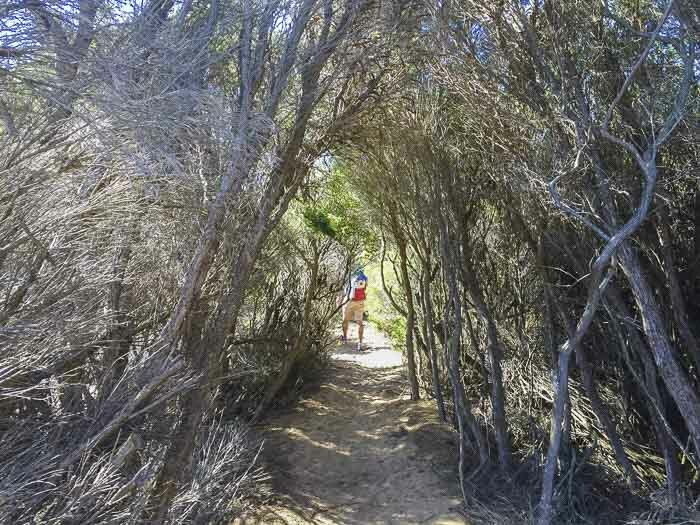 Jibbon Beach Loop Track in Bundeena -in the Royal National Park- is not for beginners, although it is not a really strenuous hike. The scenery is unbeatable in a clear day. Look at the photos! You will feel totally invigorated after the walk. Jibbon Beach Loop Track starts at the entrance of the beach via the short pathway that can be accessed from Neil Street in Bundeena. Jibbon Beach is the most eastern beach at Pork Hacking. 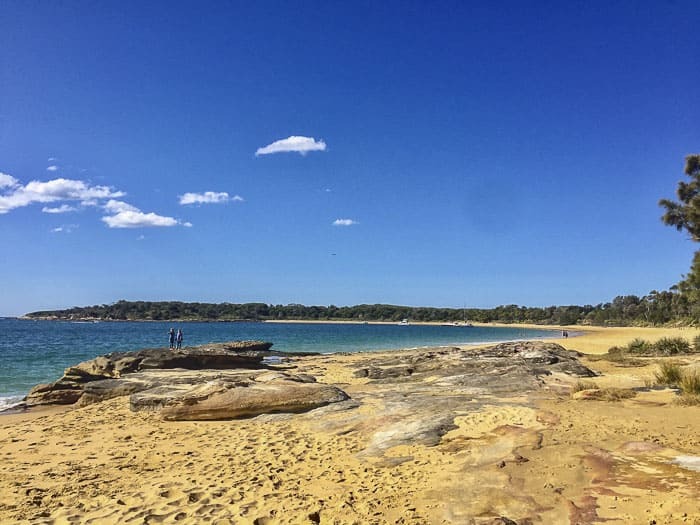 Bundeena has four beaches and this is -without doubt- one of the most beautiful ones. Jibbon Beach is part of the Royal National Park. 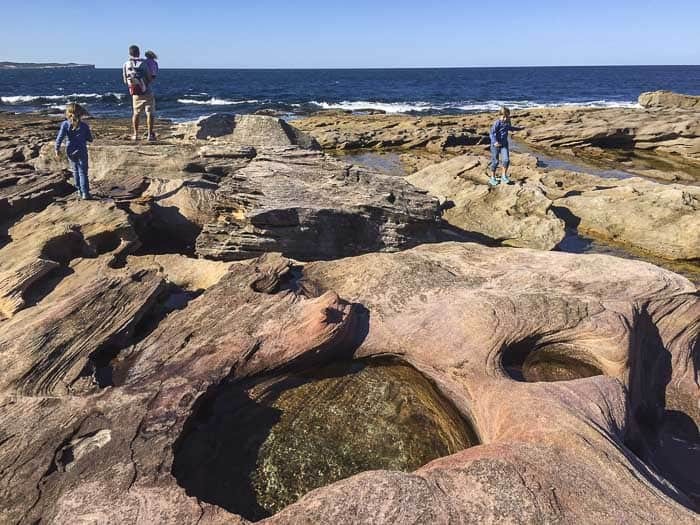 Many years ago, the Jibbon headland in Royal National Park was home to the Dharawal people. 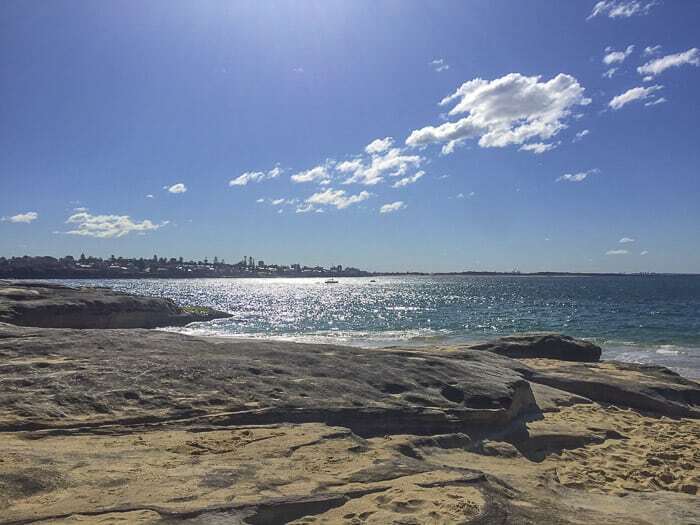 The word Jibbon (derived from the Dharawal word djeebahn) means sandbar at low tide, which is very interesting because the Jibbon Beach is quite long. Jibbon Beach is not patrolled. Although the waters are usually quite calm, a few meters out, it is quite deep. This is why you might see boats that are anchored off close to the beach. The track includes a very ancient site of rock engravings. 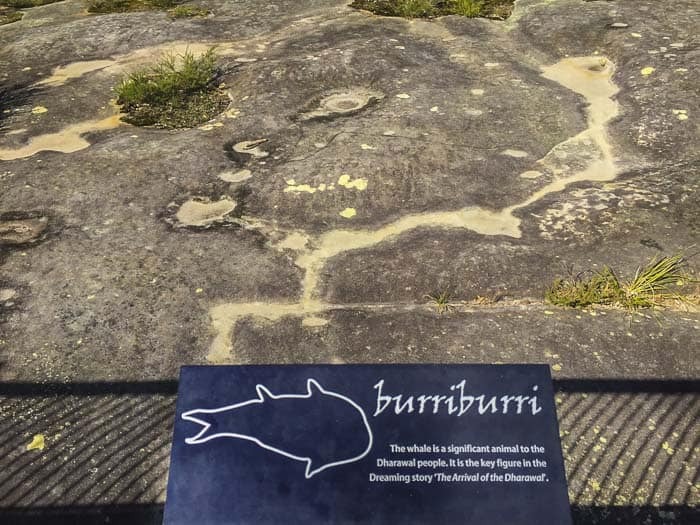 Although some engravings are difficult to distinguish, the viewing platform with explanatory signs provide excellent information to learn about the Dharawal, the Aboriginal that used to live in South and South-West Sydney. From the main track, a sidetrack takes you to a long boardwalk that ends with the mentioned viewing platform. Only choose this track, if you have already done some hikes with your children before. On Hello Sydney Kids, you can find plenty of information of easier tracks. 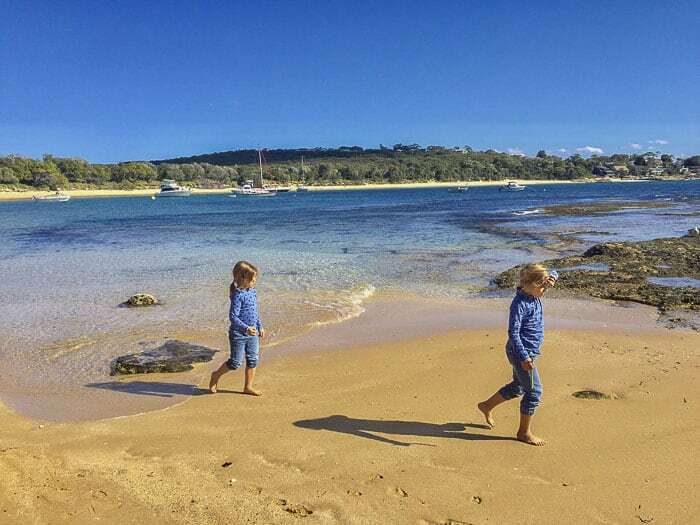 You can read a compilation of Sydney’s best family-friendly bush, parks and beach walks here. 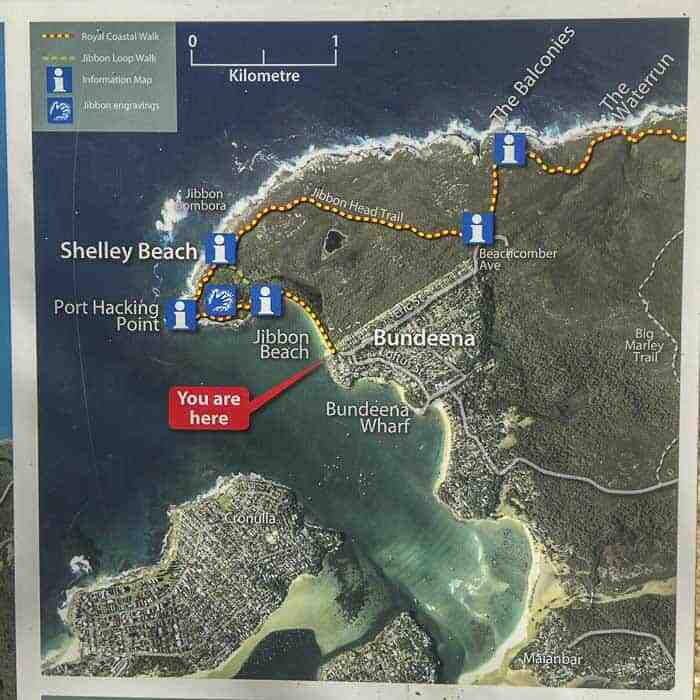 The total circuit is around 5km starting from Bundeena (1km less, if you start from Jibbon Beach). The shade is limited, so wear hats or/and put some sunscreen on. Check weather forecast and be aware that weather conditions can change. 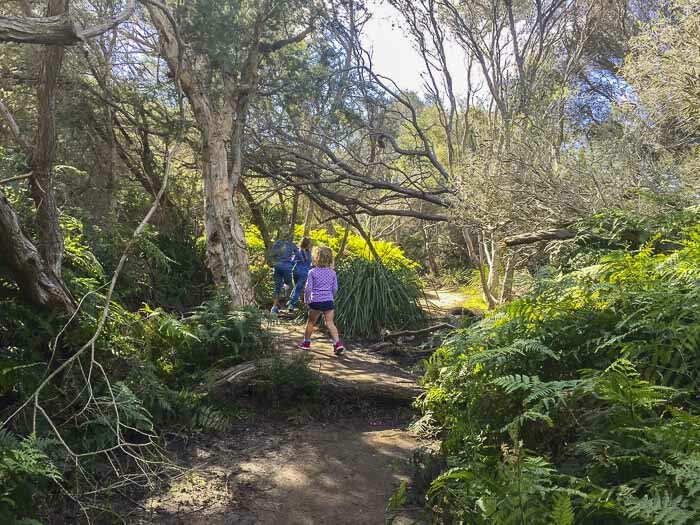 Walking tracks in NSW National Parks are not always well maintained; so make sure that you know where you are going before starting your adventure. Some sections of the Jibbon Beach Loop Track are quite exposed. There are not warning signs. There is no tap water along the circuit. Pack plenty of water, snacks and a first aid kit. There are no toilets. The closest ones are in Bundeena. Snakes have been spotted on this track. Pack your swimmers! (Note: Jibbon Beach and Shelley Beach are unpatrolled). Aboriginal rock engravings and shell midden. 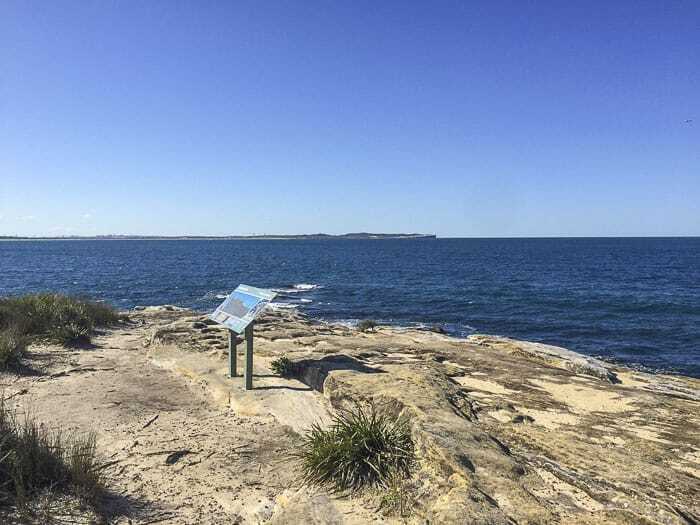 Amazing views of Cronulla and Port Hacking. Great place to spot whales during the whale season. Kangaroo footprints (or you might even see one!). 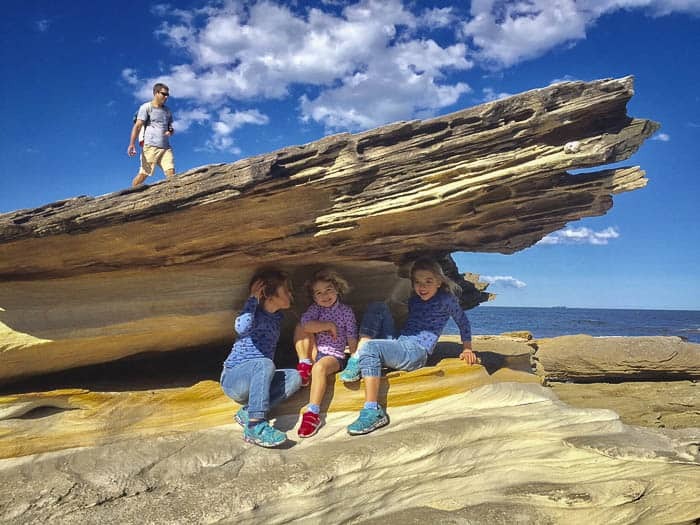 Amazing sandstone rock formations in Shelley Beach. And, very colourful coral and seashells in Shelley Beach. Check out more wonderful Sydney family walks on the compilation post right here. 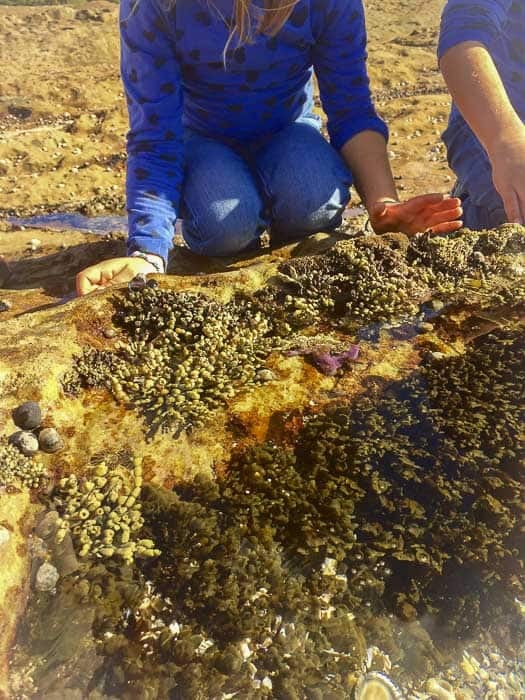 You might also enjoying reading Top 10 Things To Do With Kids in the Sutherland Shire here. We did the Jibbon Beach Loop Track in autumn and it was definitively one of the best day trips of 2017! It is one of those excursions that helped us to clear out the cobwebs of our minds. Plus, it was great exercise. What do you do to clear your cobwebs? Do you have a preferred destination or walk that you might like share? We would love to hear your suggestions. Thanks Raymond.. I am goingt o write a things to do in Bundeena post at some stage so much check out your company.